When Marshall and I married nearly five years ago, we brought with us the proverbial baggage of credit card debt, student loans and car notes along for the ride. I think from the start of our marriage we knew this was not what we wanted for our future as man and wife and eventual family. Girded with the knowledge of how to get out of debt (thank you very much Dave Ramsey) and the biblical command to let no debt remain outstanding (Romans 13:8 ) we began chipping away at the financial shackles with which we had allowed ourselves to be bound by poor choices. In the first year of our marriage we reduced our cumulative debt drastically and had stopped using our credit cards all together. As we approached our third year of marriage with a baby on the way, we became even more aggressive in reducing our debt. Just one month before the arrival of our sweet baby boy we were able to share with everyone that we were debt free! No car payment. No credit card looming over our head. Sweet, sweet financial freedom was ours! 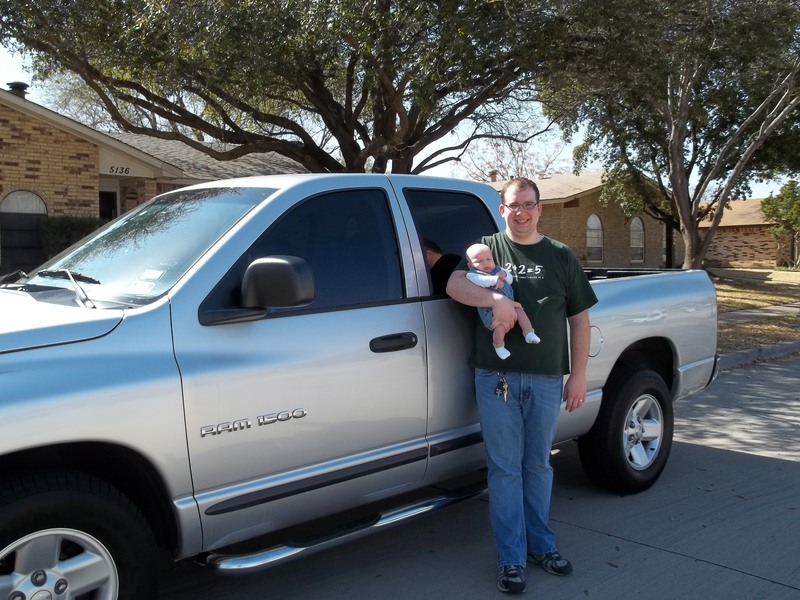 Not only that but we had a small emergency fund and enough money saved to pay cash to purchase a second used vehicle (a much needed purchase) just months after our son was born. After a few months of relishing in our financial freedom and finally finding our way out of the baby fog we began to pursue our next goals of building up a substantial emergency fund and saving for a home. As we approached yet another anniversary in sharing life together, we celebrated the financial milestone of securing that suggested 3-6 months living expenses emergency fund. Ours teeters on about 4 months of survival money that we hope we never have to touch but are thankful is available in the event there is a need. And so we began our house fund. 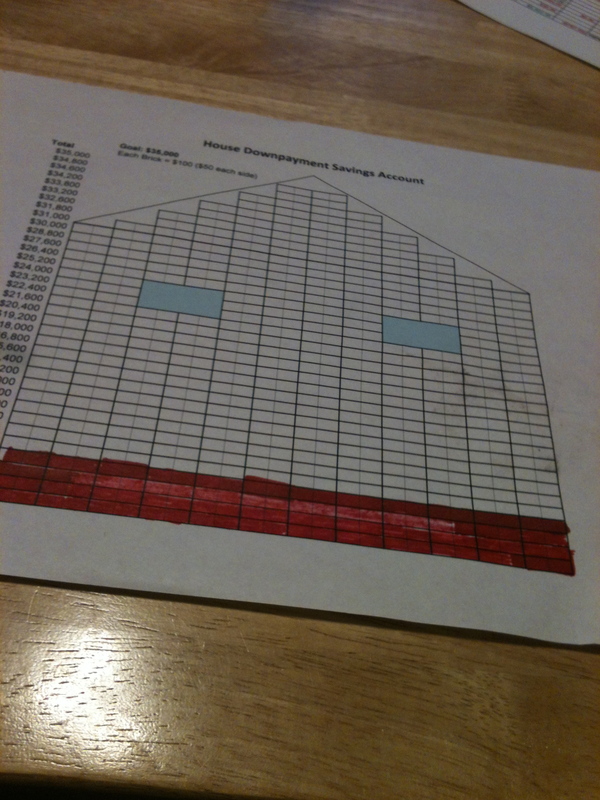 My husband, being the creative genius he is, even designed a ‘thermometer house’ that we would fill in red the appropriate amount of ‘bricks’ each month the with the amount of money saved towards our house. Brick by brick, we would aggressively put back any money we could with that dream of purchasing a home. And then one day, we decided it was time. With the advent of a second child, we knew the home we had rented nearly four years was no longer the right fit for us and it was time to take that step towards owning a home. But here is where our adventure truly began. You see, 2 years ago, when our debt was no more, we made a decision that our credit line would be no more as well. We closed every single account. So when we went to apply for a house loan, we found that we had no credit score whatsoever. This came as no surprise to us. We (read: my husband) had done the research and knew full well that our only option in acquiring a loan for a home would have to come through a manual underwrite. A much more difficult, even more highly scrutinizing process. What did surprise us was the fact that no one did manual underwrites anymore. No one except Churchill Mortgage (cue commercial endorsement). We connected with the local Churchill Mortgage company and began the daunting paperwork process and searched with hope for just the right house. After a few months of house hunting, we found ‘the one’ just waiting for us to put our finger print on it. And we made our bid. After a counter, we reached an agreement and locked in a price of $1,000 below market value and $5,000 below asking price (cue endorsement for an awesome realtor: Tonia Merlene). I shan’t bore you with the logistics of our loan but the process has been grueling. Although we are less of a financial risk than most people with a credit score, the hoops and hurdles we have had to jump through have been many and in some instances down right ridiculous. But we will close on Tuesday. We are bringing to the table a down payment of 3.5% and yes we are paying most of our own closing costs. A bad deal some might say. But we don’t agree. We will have less of a loan because of the money we are putting up front and given our track record will have this house paid off much sooner than the loan’s timeline. Amidst all this saving, you might think we haven’t truly lived our lives these past five years. I would highly disagree. We have lived a very fruitful life. We’ve grown closer as a couple and family, made lifelong friendships, sacrificially given, saved for items we really wanted, and taken those much needed family vacations. Our vehicles are not brand new, much of our furniture is second hand and our new home is just over 20 years old. We are living well below our means and look forward to teaching our children the values of working hard, delayed gratification, cheerful giving and the love of family. We are not keeping up with the Jones….and it feels great. Beautiful home & I am so excited for you! I am proud of you and Marshall!! It’s beautiful! I know you are so happy and I celebrate with you. Best of luck, new home owners! Patty, I’m so happy for you! You and Marshall can start a young peoples group teaching others how to get their finances down & not keep up with the Jones’s! The house is beautiful-I’m proud of you! When do you move in? Beautiful home. I am so happy for you. So happy for you and proud. You have a beautiful home where I know you’ll make many wonderful memories. Wonderful testimony that all young people should heed. Congratulations and best wishes. 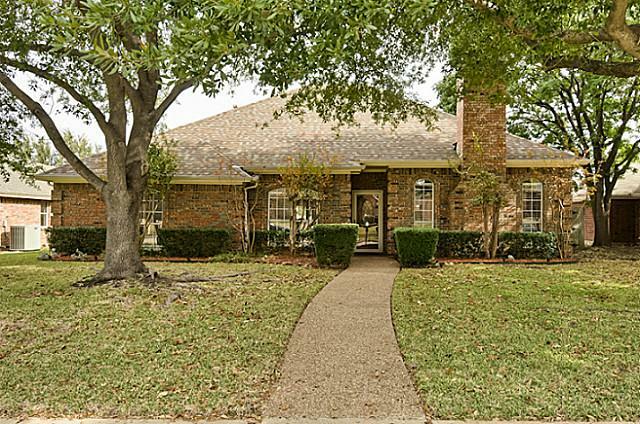 Patty, We are so excited for your family, and what a beautiful home to grow in. You guys are so cute together! Love the post and pictures, but do miss you!